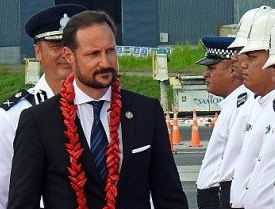 His Royal Highness Crown Prince Haakon arrived yesterday at his last destination on his Pacific tour. The Crown Prince arrived in Samoa where he was officially welcomed on arrival in the capital, Apia. Click on the link below to read the full article.